8.23.18 I followed this recipe to the letter and wouldn’t change a thing, it turned out awesome. I sliced the onions and mushrooms and mixed up the meat patties (including the pork) in the morning, put them in the fridge, and then this was just a breeze to make later for dinner in the Instant Pot®. 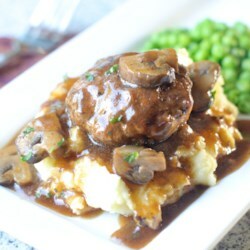 The gravy is absolutely delicious, and that little bit of red wine adds incredible richness and depth of flavor. Do use a good-quality beef broth/stock (the only one that I buy is Kitchen Basics® for beef, chicken, and vegetable), and it’s what has been used in every cooking class that I’ve ever taken (well, I haven’t taken that many, but they’ve always used Kitchen Basics). Not sure what happened to my onions, as they seem to be barely visible, but their flavor contributes greatly to that crazy-good gravy. Some might say “…hey, this is just salisbury steak,” but this turned out exceptionally well, that’s why I’m raving about it. This one’s going into my Favorites, definitely a “make-again” recipe.